Small bore enthusiast P.O. Ackley designed 17 Hornet ammo as a wildcat cartridge capable of extreme velocities. The 17 Hornet came about by taking its parent case, a .22 Hornet, and necking it down for a 17 caliber round. The 17 Hornet was considered to be one of the best balanced 17 caliber cartridges, known for it’s accuracy and flat shooting capability. The modern 17 Hornet can push a thirty grain projectile at just under three thousand feet per second. Lowering the round weight can increase its velocity significantly. A 20 grain cartridge can reach up to 3,500 feet per second. This round features a significantly high velocity, but has a very light feeling recoil. The round is also quiet and very comfortable for new shooters to fire, even in bulk quantities. 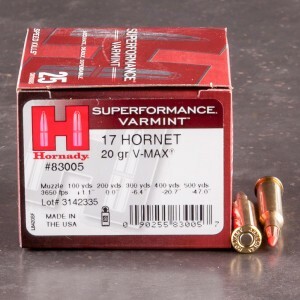 The cartridge can also be loaded with a modern hunting projectile that expands on impact, you can find all our hollow point and solid point 17 Hornet ammo for sale listed below.